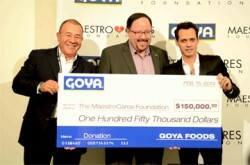 The Maestro Cares Foundation, a non-profit organization founded by pop icon Marc Anthony and Chicago entrepreneur Henry Cardenas, has received a $150,000 donation from Goya Foods, the largest Hispanic-owned U.S. food company. Maestro Cares was launched in January 2012 to support the housing and educational needs of underprivileged children in developing Latin American countries. The donation will go towards the development and construction of a new orphanage for over 200 children at the Orfanato Niños de Cristo in La Romana, Dominican Republic. “Goya has always believed in lending a hand when it is needed most, whether it is here in the United States or abroad,” says Bob Unanue, President of Goya Foods. We are thankful for this generous donation from Goya. Their gift will help feed, clothe and educate children who desperately need it,” says Henry Cardenas. For more information about Goya, please visit Goya.com and to find out how you can donate to the Maestro Cares Foundation, visit maestrocares.org.